Dedicated on June 17, 1925, the Carillon Tower was built in lasting honour of those from Norfolk who paid the supreme sacrifice during the First World War. The Norman architectural styled tower is 60 feet tall and contains a carillon of 23 bells, the heaviest weighing 1,568lbs. The firm of Gillett & Johnson, England produced ..
On August 10, 2014 Norfolk Remembers the Great War: 1914-1918 was officially launched. A special gathering was held at the Royal Canadian Legion, Branch 79 Simcoe where inscribed copies of the book were presented to Jeanne Hornby, Legion representatives and others who had been of considerable assistance with the project. In the afternoon the public launch was .. The NRC was established in 2014 as a centennial project to commemorate the start of the First World War. Its volunteer members represent local service organizations such as Rotary, Lions and the Royal Canadian Legion. The Norfolk County Public Library, Simcoe Branch has been involved since its inception with staff facilitating the Norfolk Remembers The .. 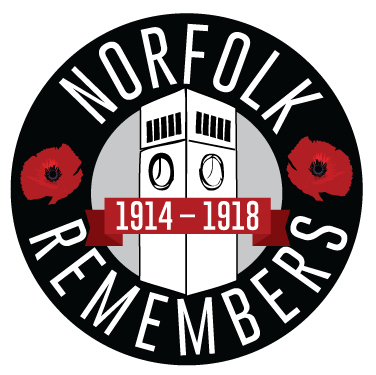 Welcome to the newly created Norfolk Remembers website. Please take a moment to view the above links for information about the NRC, upcoming projects and the archives. If you have any information to contribute please feel free to contact us!